Lush hills, wild mountains, crystal clear lakes, raging rivers and mysterious forests: Bavarian nature invites visitors to discover and experience it and inspires them to have an active holiday with the whole family. Impressive mountains, gentle hills, beautiful valleys and glorious scenery – this can all be found in the Bavarian Alps and the Alpine foothills. There are unlimited options for making your holiday sporty and active. 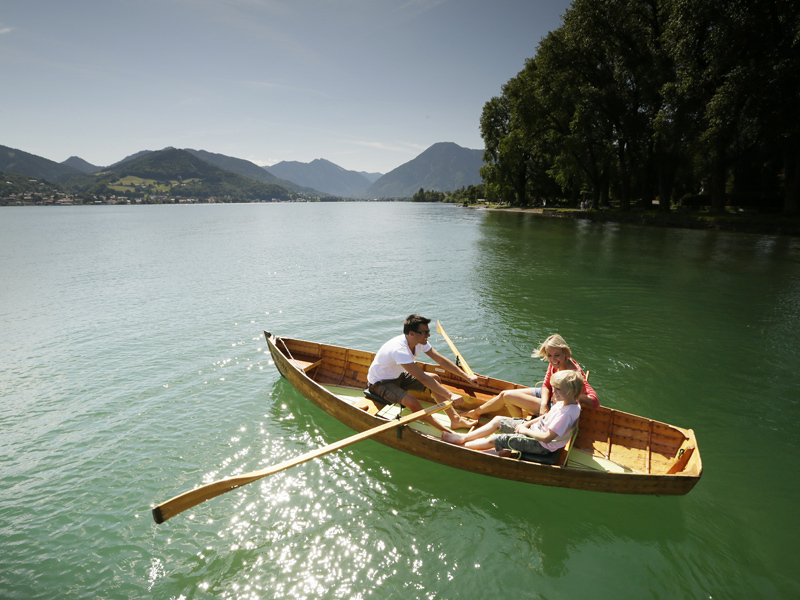 The natural regions in the Bavarian mountains are a leisure paradise for the whole family. The unlimited variety of routes with different levels of difficulty is heaven for hikers, climbers and cyclists. The reward for a strenuous hike, climb or mountain bike ride can be found at the top of the mountain. The panorama over the Bavarian mountains compensates you for all your efforts on the route up. On the way, numerous alpine huts invite you in for refreshment: after all, what could be better after a walk than a traditional Bavarian snack or a Kaiserschmarrn pancake with raisins? As well as the largest lake in Bavaria, the Chiemsee, there are a number of smaller lakes which are real hot tips and are also perfectly suited for an outing with a rowing or sailing boat. A rafting trip on the Isar is the right thing for anyone who loves taking a dip in cold water in conjunction with action. This can get a bit wild – but with a helmet, wetsuit and life jacket, you are perfectly equipped for it. The particular breeze on Lake Walchensee is popular with all kite and wind surfers, as well as with adherents of the trend sport stand up paddling. And the rough rock walls of the east wall of the Watzmann give Lake Königsee, Germany's only fjord, a picturesque, romantic image. Wakeboarders come and go on Lake Steinberger in the Upper Palatinate Lake District and Lake Hödenauersee in Upper Bavaria. The facilities are amongst the most modern in Germany. Of course, water skiing or monoskiing are also possible. There is one thing they all have in common: the lakes in Bavaria all have drinking water quality. Time out for everyone! Do the milking yourself instead of all-you-can-eat. Real country life instead of full-time animation. The Bavarian farms invite visitors; to spend the night, get involved, ride ponies and feed the chickens. Amidst the most beautiful scenery: in the Bavarian countryside! Whilst children ride on the tractor and help the farmer to herd the cattle, parents can relax on the sun terrace and simply breathe in the fresh and aromatic country air. And the food is regional delicacies with products straight from the farm.